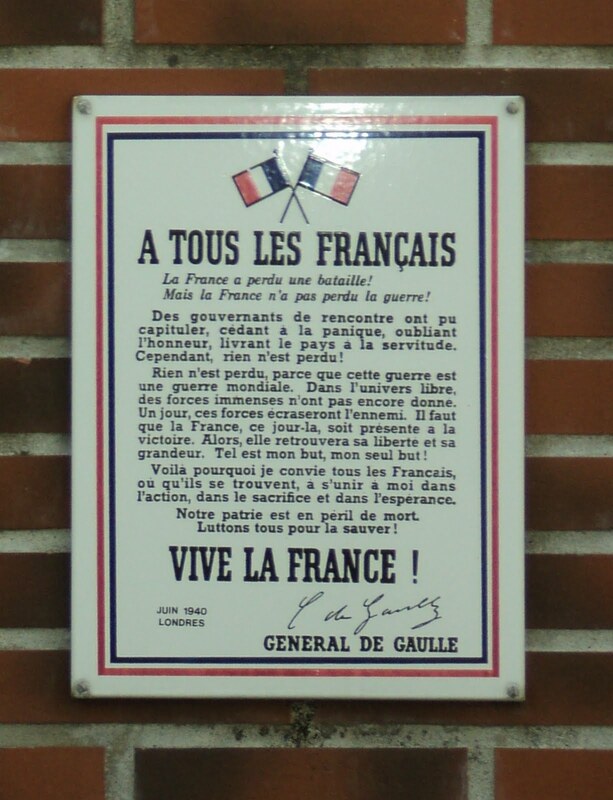 French Photo Du Jour: "I call upon all Frenchmen..."
On this date in 1940, General Charles de Gaulle made his famous speech over the BBC from London. It was his call to arms, an impassioned plea to his fellow countrymen to rise up against the Germans and Italians. This small excerpt, the end of his speech, hangs on a wall outside our mayor's office. There is an identical one in the next town on a war memorial. "The French government, after having asked for an armistice, now knows the conditions dictated by the enemy. The result of these conditions would be the complete demobilisation of the French land, sea, and air forces, the surrender of our weapons and the total occupation of French territory. 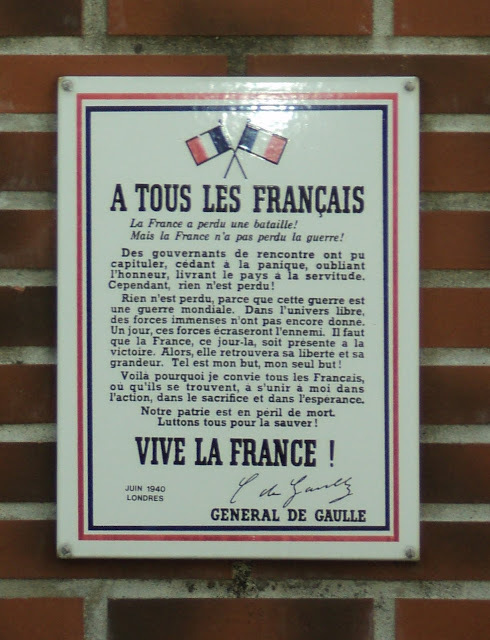 The French government would come under German and Italian tutelage. I say honour, for France has undertaken not to lay down arms save in agreement with her allies. As long as the allies continue the war, her government has no right to surrender to the enemy. The Polish, Norwegian, Belgian, Netherlands, and Luxemburg governments, though driven from their territories, have thus interpreted their duty. I say common sense, for it is absurd to consider the struggle as lost. True, we have suffered a major defeat. We lost the battle of France through a faulty military system, mistakes in the conduct of operations, and the defeatist spirit shown by the government during recent battles. But we still have a vast empire, our fleet is intact, and we possess large sums in gold. We still have allies, who possess immense resources and who dominate the seas. We still have the gigantic potentialities of American industry. The same war conditions which caused us to be beaten by 5,000 planes and 6,000 tanks can tomorrow bring victory by means of 20,000 tanks and 20,000 planes. Long live free France in honour and independence!"